maNavALa mAmunigaL opines that he had pointed fingers at SrI rAmAnuja for his pitiable condition and also pleaded him to get him out of his dire straits. maNavALa mAmunigaL paused and thought to himself that SrI rAmAnuja is one who is full of auspicious qualities as per the phrase “irAmAnusan mikka puNNiyanE (rAmAnusa nURRandhAdhi 91). If we catch his lotus feet with all love and devotion, without blaming him for my pitiable condition, will he not do the job automatically for us? maNavALa mAmunigaL then goes ahead to explore within himself whether he has any love and devotion towards SrI rAmAnuja. After some deep research, maNavALa mAmunigaL comes to the conclusion that he has nothing in that regard towards SrI rAmAnuja. iththAl en? – what is the use of saying this (without any love and devotion, just for the sake of saying it)? eppOdhu undAvadhu ini? – if not for now, when will it blossom? maNavALa mAmunigaL says that he has been uttering the sacred phrase “emperumAnAr thiruvadigaLE SaraNam” incessantly without any result. He says that he does not really realize the meaning of it and said it. He said it just for the sake of it and opines that there is absolutely no use saying in this fashion. Subsequently, he dives deep in his heart to explore if there is any pure devotion towards SrI rAmAnuja that may be hiding somewhere. To his utter dismay, he is not able to find any trace of it. The phrase “emperumAnAr thiruvadigaLE SaraNam” is a soul uplifting phrase for piLLai kollikAval dhAsar. The same phrase is the sustaining force for eternal enjoyment for sOmAsiyANdAn. However, maNavALa mAmunigaL feels that he too tried to utter this very same phrase that meant more than their lives for these aforementioned people. But maNavALa mAmunigaL says that he uttered the phrase just for uttering it and did not do a deep dive into its purport. He repeatedly chanted this phrase without an iota of love and devotion towards SrI rAmAnuja. maNavALa mAmunigaL explores within his heart to find any traces of love towards SrI rAmAnuja as revealed by the phrase “sArndhadhen sindhaiyun thALiNaikkIzh anbuthAn migavum kUrndhadhu (irAmAnusa nURRandhAdhi 71). He is very disappointed that he could not find an iota of pure devotion and love towards SrI rAmAnuja even until this final days of his life. He asks himself, “if not for now, when will that love blossom, if at all there is a possibility of blossoming”. He concludes that there is absolutely no use in uttering the phrase without any love and devotion. At this juncture, we should take cognizance of the fact that maNavALa mAmunigaL used the phrase “irAmAnusAya nama” in pAsuram 2. 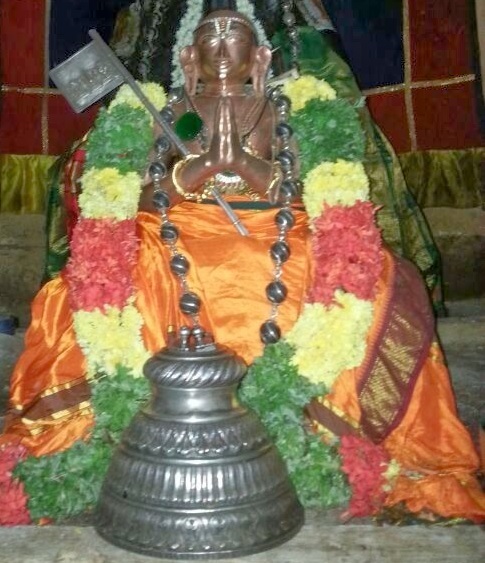 In this pAsuram, he uses the phrase “emperumAnAr thiruvadigaLE SaraNam”. Similar to dhvaya mahAmanthram, there is a SrI rAmAnuja equivalent to it. While the phrase “emperumAnAr thiruvadigaLE SaraNam” constitutes the first half, the phrase “irAmAnusAya nama” is the latter half. This entry was posted in Arththi prabandham, Other and tagged arththi prabandham, mamunigal, ramanuja on July 20, 2016 by santhanam rajagopalan.